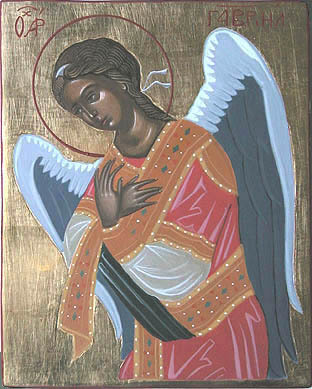 The day after the feast of the Annunciation to the Theotokos by the Archangel Gabriel on March 25th, the Orthodox Church celebrates a Synaxis in honor of the Archangel Gabriel. Yet on July 13th we find ourselves celebrating another Synaxis in honor of the Archangel Gabriel. Why do we celebrate two Synaxis' of the Archangel Gabriel? It seems nobody really knows the exact reason for this. St. Nikodemos the Hagiorite writes in his Synaxaristes that he searched for the sources of the Synaxis celebration on July 13th, but could not find anything. He speculates that it has to do with a miracle of the Archangel performed on this date, the details of which have been lost. Others speculate it has to do with the feast of the Annunciation falling during Great Lent, and in order to greater celebrate this feast it was moved to July 13th. The problem with these two theories is that, although entirely possible and valid, there is no evidence to support them. St. Nikolai Velimirovich in his Prologue seems to have a possible reason for these two feasts. For March 26th he writes about the work of the Archangel Gabriel regarding the Incarnation of the Lord, and that this Synaxis commemorates his specific involvement in the Incarnation. For July 13th he speaks of its origins coming from Mount Athos in the ninth century, and it has to do with the appearance of the Archangel Gabriel in a cell near Karyes where he revealed the hymn "Axion Estin". This miracle prompted the fathers of Mount Athos to commemorate all the miracles of the Archangel Gabriel, from the times of the Old Testament till the present. This local tradition on Mount Athos eventually passed into the entire ecclesiastical life of world Orthodoxy. It seems probable for all the reasons above that we celebrate the Archangel Gabriel in a Synaxis twice in our ecclesiastical calendars.